health and beauty of your garden for years to come. - The premium BPA-Free plastic material can tolerate intense heat, sun, and harsh weather. - It can absorb and retain necessary warmth and moisture for root development. - The smart easy-to-use design makes it great for first-time gardeners. - Retains its lovely eye-catching look for more than 10 years. - Backed by a 30-day guarantee that lets you get a full refund. 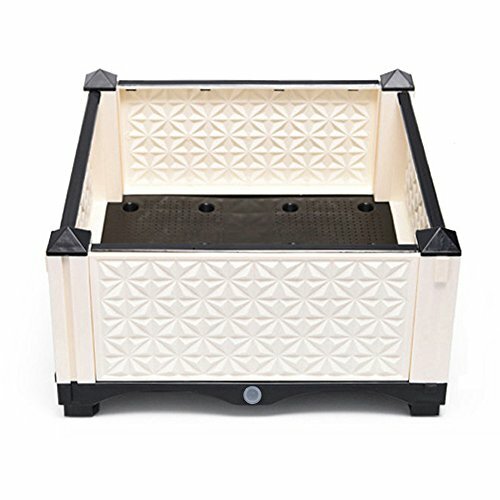 - DURABLE RAISED BEDS: Unlike other elevated garden beds that quickly rot away or easily rust, The VeraCasa raised garden planter box is made from premium PP plastic that is BPA-free and impressively sturdy, 100% weather resistant, and can withstand the harshest heat. So you can confidently leave it outdoors without peeling or fracturing. - PLENTY OF ROOM: Measuring 17 ¾" x 17 ¾" x 9 13/16", this raised vegetable garden bed kit has ample space for planting vegetables, herbs, flowering plants, and other crops. No dealing with a shallow vegetable planter box that is hard to tend to and limits the kinds of plants grown. Get one that is a breeze to manage even for beginners and comfortably accommodates even long-rooted plants. - PRACTICAL DESIGN: Our elevated raised garden bed stands out because of the built-in drainer system. In addition, there are plugs on all sizes for water discharge. It accommodates well the different needs for water and moisture of all kinds of plants and vegetables. - QUICK ASSEMBLY: Getting this raised plastic planter box all set up is quick and easy. It takes about 10 minutes to have it fully assembled for use. A mallet may be needed. Assembly instruction and video will be sent to you digitally. - 100% MONEY-BACK GUARANTEE: We guarantee that our raised beds will look good as new even after 10 years of use. We're so confident about the quality of this raised vegetable garden bed elevated planter that we've backed it with a 100% money-back guarantee. Return it within 30 days in case of any dissatisfaction and receive a full refund with no questions asked. Click 'Add to Cart' now! If you have any questions about this product by VeraCasa, contact us by completing and submitting the form below. If you are looking for a specif part number, please include it with your message.